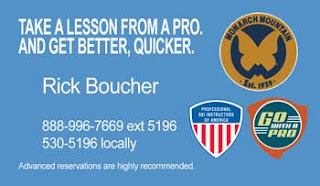 Here is an image of business cards that I used most of last winter. The phone numbers are the ski school sales office. I’m thinking of adding my own mobile number, email address, and this blog URL to the card. Normally I have not involved myself in booking lessons for guests. I leave that all up to the sales staff. I’m wondering if I can offer better service by becoming very involved with helping my guests choose the best product (which will require me to really know all the many available products) and assist in their scheduling of our times together. My thought is that it will facilitate better relationships with my guests which is better for Monarch and for my guests. You can post your business card on http://www.belynx.com , a new website for instructor where potential students can find pros.